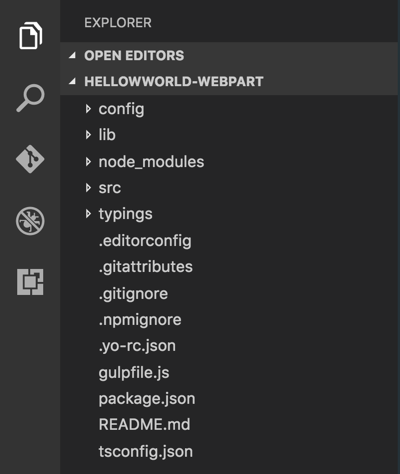 Accept the default helloworld-webpart as your solution name and choose Enter. Select Use the current folder for where to place the files. Accept the default HelloWorld as your web part name and choose Enter. Accept the default HelloWorld description as your web part description and choose Enter. This command will execute a series of gulp tasks to create a local, Node-based HTTPS server on 'localhost:4321' and launch your default browser to preview web parts from your local dev environment. Modify the text in the Description text box to Client-side web parts are awesome! One of the new capabilities available to the property pane is to configure its update behavior, which can be set to reactive or non-reactive. By default the update behavior is reactive and enables you to see the changes as you edit the properties. The changes are saved instantly as when the behavior is reactive. You can use Visual Studio Code to explore the web part project structure. 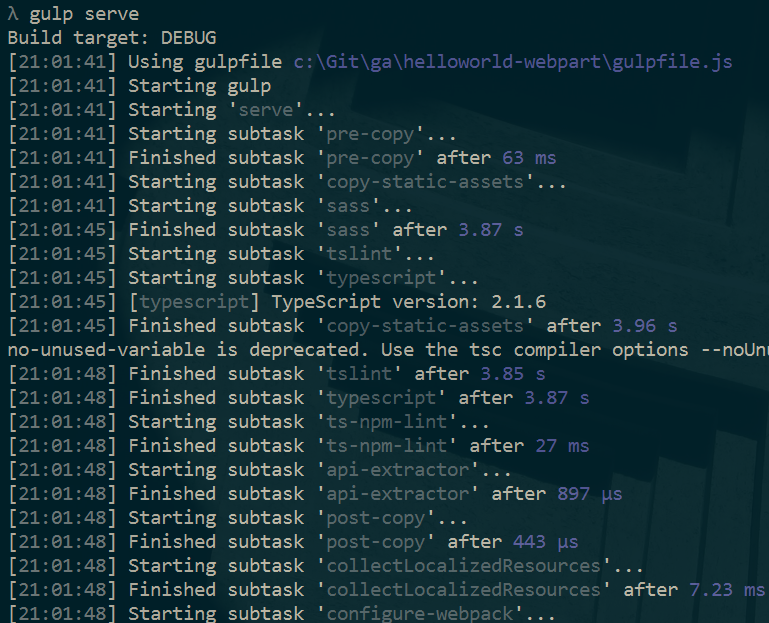 In the console, go to the src\webparts\helloWorld directory. If you get an error, you might need to install the code command in PATH. The following are some key files in the project. HelloWorldWebPart.ts defines the main entry point for the web part. The web part class HelloWorldWebPart extends the BaseClientSideWebPart. Any client-side web part should extend the BaseClientSideWebPart class in order to be defined as a valid web part. BaseClientSideWebPart implements the minimal functionality that is required to build a web part. This class also provides many parameters to validate and access to read-only properties such as displayMode, web part properties, web part context, web part instanceId, the web part domElement and much more. Notice that the web part class is defined to accept a property type IHelloWorldWebPartProps. The property type is defined as an interface in a separate file IHelloWorldWebPartProps.ts. This property definition is used to define custom property types for your web part, which is described in the property pane section later. The property pane is defined in the HelloWorldWebPart class. The propertyPaneSettings property is where you need to define the property pane. Notice that we are performing a HTML escape on the property's value to ensure a valid string. Read the Integrating property pane with a web part article to learn more about how to work with the property pane and property pane field types. Lets now add few more properties - a checkbox, dropdown and a toggle - to the property pane. We first start by importing the respective property pane fields from the framework. Next, update the web part properties to include the new properties. This maps the fields to typed objects. Open IHelloWorldWebPartProps.ts and replace the existing code with the following code. Switch back to the HelloWorldWebPart.ts file. Replace the getPropertyPaneConfiguration method with the code below which adds the new property pane fields and maps them to their respective typed objects. The web part property pane will now have these default values for those properties. The HelloWorldWebPart.manifest.json file defines the web part metadata such as version, id, display name, icon, and description. Every web part should contain this manifest. Now that we have introduced new properties, make sure that you are again hosting the web part from the local developement environment by executing following command. This will also ensure that the above changes were correctly applied. 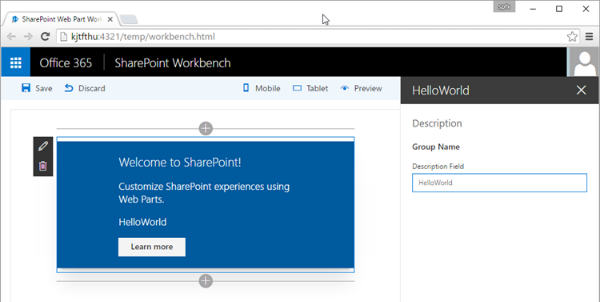 SharePoint Workbench is also hosted in SharePoint to preview and test your local web parts in development. The key advantage is that now you are running in SharePoint context and that you will be able to interact with SharePoint data. Note: If you do not have the SPFx developer certificate installed, then Workbench will notify you that it is configured not to load scripts from localhost. 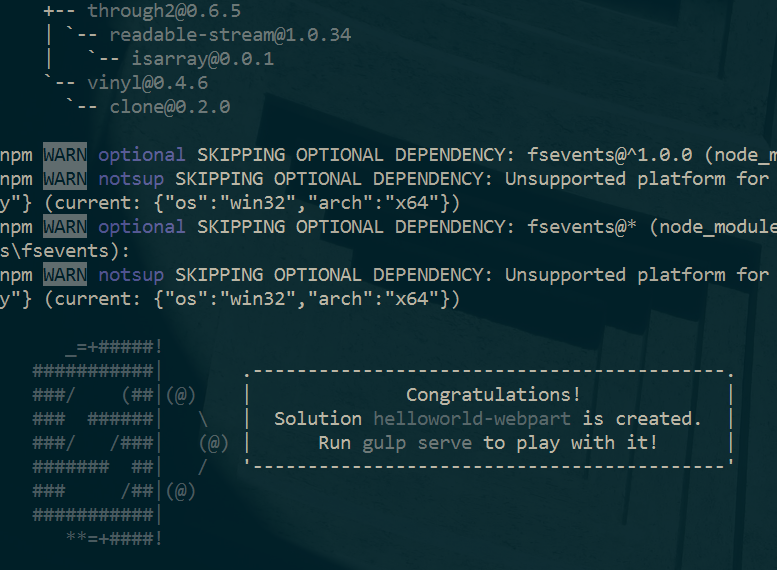 Execute gulp trust-dev-cert command in your project directory console to install the developer certificate. 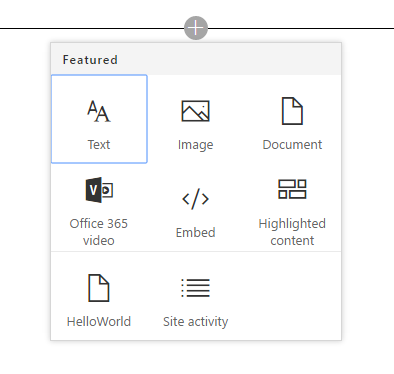 Notice that the SharePoint workbench now has the Office 365 Suite navigation bar. Choose add icon in the canvas to reveal the toolbox. The toolbox now shows the web parts available on the site where the SharePoint workbench is hosted along with your HelloWorldWebPart. 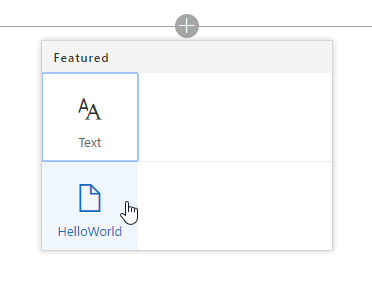 Add HelloWorldWebPart from the toolbox. 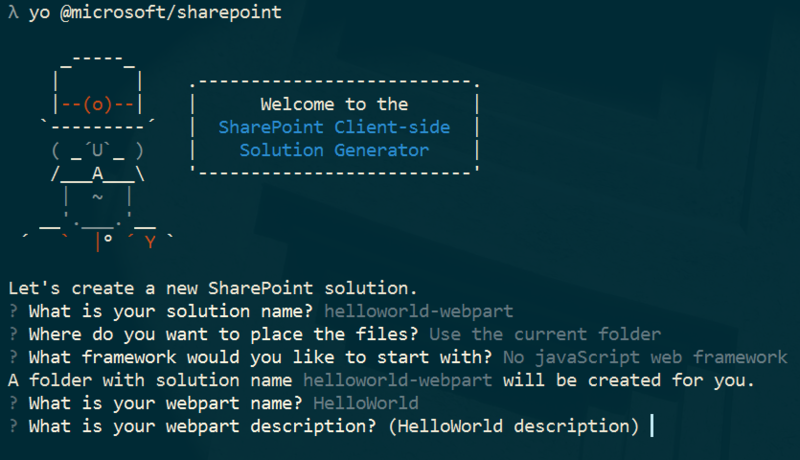 Now you're running your web part in a page hosted in SharePoint!